Yesterday I found the first scaly-stemmed flower of Coltsfoot pushing itself up through the disturbed ground of a plantation in Bankfoot. The plant, also called “Son-afore-the-Father” due to the fact that the flowers appear many weeks before the hoof-shaped, hairy leaves, is a spring herald. It’s particularly welcomed here because by mid-February I have always been caught by one of those coughs that cling to the tail of a winter cold and threaten to sit on your chest for months. This year is no exception. 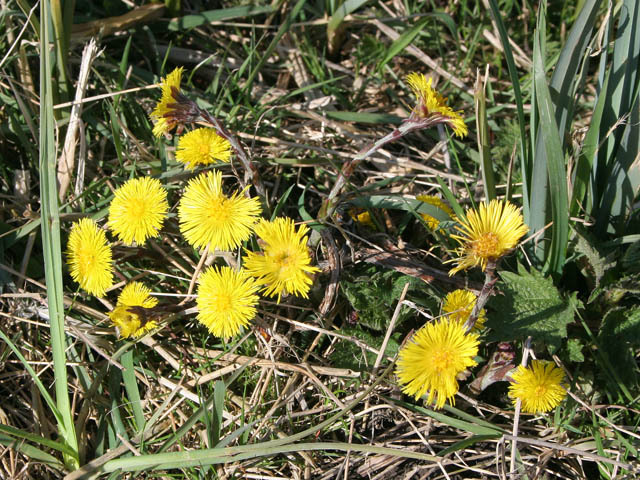 Coltsfoot leaves and the sunny, dandelion-like flowers are equally useful for treating coughs, though personally I can’t bear to pick the brave flowers and collect and dry leaves all summer instead to see me through. They can be made into a tea, or a decoction. Of old, they have been used in herbal tobacco, too, but it beats me how smoking anything can cure a cough, so I’ll stick to tea. It doesn’t have much flavour, so I add evergreen thyme (also good for coughs!) in winter, and in summer a few leaves of mint, lemon balm or meadowsweet. Fresh coltsfoot leaves can also be used as a vegetable and even yield a yellow-green dye. This winter, thanks to an excellent evening class in herbal medicine I have discovered another cough-soothing delight – liquorice. I have never liked liquorice allsorts, and for all I respect the monks of Pontefract, their “cakes” and the long tradition of growing and processing liquorice in that district, NOTHING would have persuaded me to chew liquorice root if I’d known what it was. But the unprepossessing and rock-hard root is something else entirely. The flavour is sweet and delicate; I’ve been boiling chopped root for ten minutes, then adding coltsfoot leaves. On Bad Throat Days, in goes a spoonful of honey from my bees too. Liquorice has been used medicinally for over three thousand years, for constipation and stomach ulcers as well as bronchial complaints. It’s a substance called glycyrrhizin in the roots, sweeter by far than sugar, which accounts for its use in confectionery. I don’t know which bit makes foam, but it’s also used in fire extinguishers! Coltsfoot is best gathered in the wild unless you have a large garden – it spreads most obligingly. Liquorice, a native of south-eastern Europe, is slow to germinate, the seeds are expensive, and it will take a while to produce worthwhile roots. But it has pretty foliage and pea-like flowers to enjoy while you are waiting, so is well worth growing. Today, five inches of snow covered 2005’s first coltsfoot, and I’m still coughing, so spring had better get a move on. The hedgerow pharmacy is in demand! This week I’ve been increasingly bored with what I’m eating, and failing to do much about it. High point was James next door discovering a row of parsnips he’d forgotten about and didn’t want; lovely roasted with pheasant on Sunday, but then it was on to another week of variants on stew which all tasted the same. On Thursday I even forgot to take the food flask to work, so went from 7am to 6pm on a boiled egg and some REALLY boring yarrow tea. My students offered me various Pot Noodles and Crisp Rolls but I resisted; even the cake, with which one student insisted on rewarding me in shock at passing an assessment, I passed on to a colleague whose birthday it was. By the time I crawled home, I considered myself crazy to be doing this. And then I ate a baked potato and a poached egg and was full, and couldn’t be bothered to eat or prepare anything else. Not surprisingly, I am losing weight. I need a belt to keep my trousers up. What’s helping me lose weight? Not avoiding carbohydrate (as a one-time (briefly) Atkins diet veteran, I couldn’t go through that again). I am eating less carbohydrate – and what I am eating is mostly the starchy kind. But then I’m eating less of everything. No dairy produce – apart from the small quantity of home made cheese I’ve now discarded (partly suspicion it didn’t smell so good, partly because I dropped it in the washing up water). Anyway – crossly I chopped up skinny leeks and bits of vegetables and herbs, pushing aside packets of biscuits left out to annoy me and odd bunches of dried chillies…… hang on. How could I have forgotten? I GREW THOSE CHILLIES – AND DRIED THEM IN 2007! So I could use them! Why hadn’t I thought of that before? Chopped and chucked one into the stew – would it still have any power? It did! Oh joy, a change in flavours….. and I had the first of my forced rhubarb for pudding; so tender and sweet I had only to add a touch of redcurrant jelly to make it palateable. Sweeteners – honey and sycamore syrup – are getting low, it’s a good thing I am getting used to sharper tastes. Wild greens are forming a larger part of my diet. Orpine (Sedum telephium), a native succulent with fleshy, crunchy leaves, is available, nice in salads and I’ve added it to stew as well. Nettles are appearing, and I’ve seen the first Bistort coming up, so will try a variant on Dock Pudding soon. Comfrey and ground elder remain mainstays – going in everything. Wild garlic and Welsh Onions and Three-cornered leeks are lined up to replace garden leeks of which I have only 4 left. No hardship in wild greens – they have always been one of my favourite foods. I like their strong, pronounced flavours and the freshness after months of root veg. I also noticed Meadowsweet (Filipendula ulmaria) coming up – a beautiful white flowered native found in dampt meadows andboggy ground. It contains salicylic acid, and aspirin was first synthesised from it. I made some meadowsweet tea forthwith, it is a quite distinct flavour, can cure a headache (not that I had one) and as welcome a change drinks wise as peppermint was last week.. I am now past the half-way point to Easter Sunday, a challenge coming up next week when I go off to Ullapool for a 3 day student trip, if I get through that I’ll be on the downhill stretch.